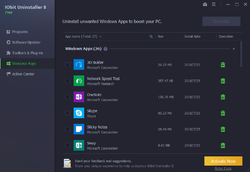 iOBit Uninstaller Pro 8.4 was available as a giveaway on March 21, 2019! There are also many improvements in IObit Uninstaller 8. The enhanced scan engine ensures quick and thorough cleanup of all leftovers, just like they've never existed on your PC. 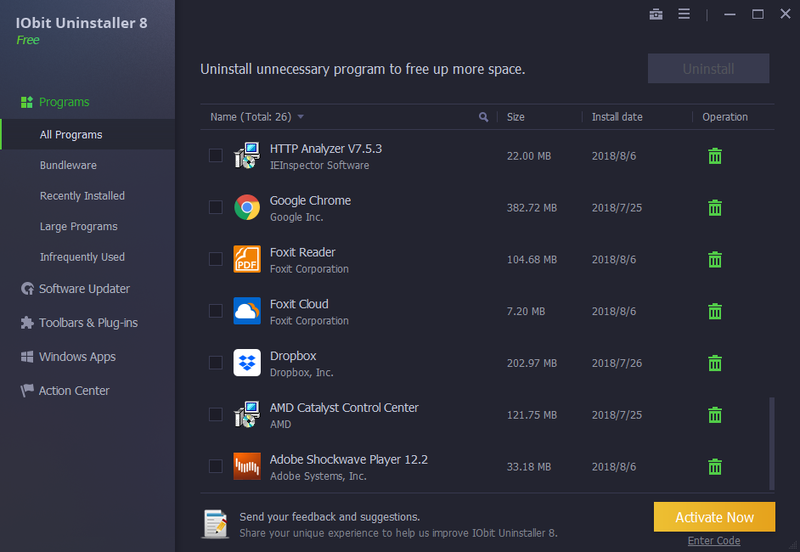 With the unique and enlarged database, IObit Uninstaller 8 makes it easy to uninstall stubborn programs that cannot be uninstalled in the normal way. Software Updater is also improved to easily keep more important programs always up to date. 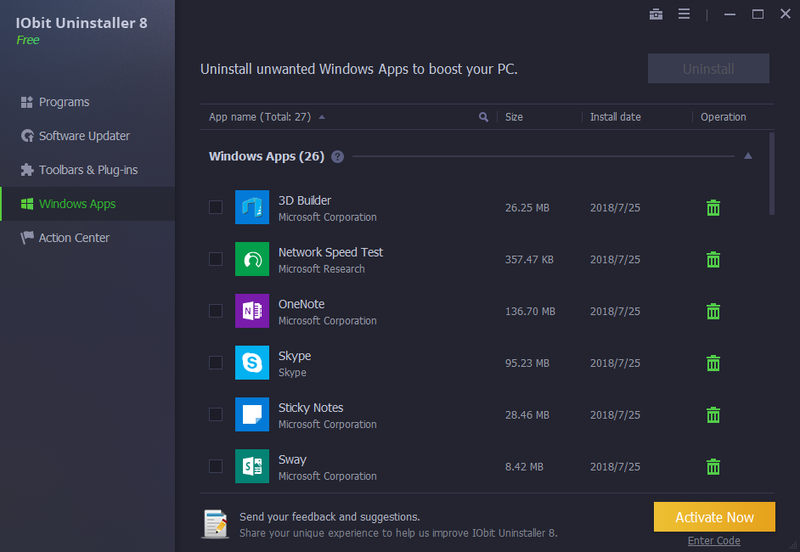 What's more, IObit Uninstaller 8 supports removing Windows apps under non-administrator accounts and the latest UWP apps on Window 10 to free up more storage space. 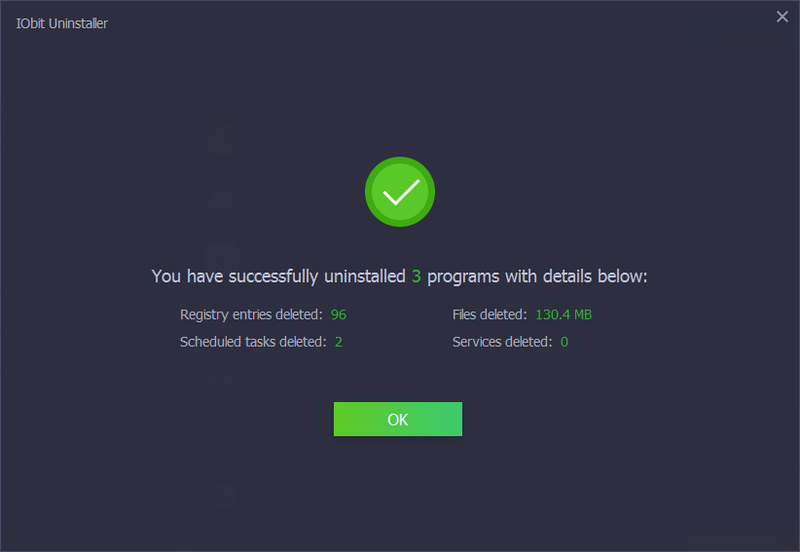 How would you improve iOBit Uninstaller Pro 8.4? Revo Pro 4 and Ashampoo Uninstaller are also ONLY TRIAL programs. You must BUY full version after 30 days !! I think your find its in the read me file, part of the download. VERY INVASIVE in how it runs & what it also installs!!!!! Cannot really do a portable installation either, as it also installs AppData>IoBit folder with junk in it & when a "portable" installation is run. It also does not clean it out that folder when installing the "portable" installation. "Portable" installation also appears in the list of "Installed" programs, which a portable installation should not. Also NOT ENOUGH USER CONTROL & CUSTOMIZATION!!!! VERY INVASIVE CONTROL by IOBit. I tweaked the very few custom settings & tried to turn off any of the very few "Auto" settings & yet later up popped a notification that 2 programs needed updating!!! I didn't ask the program to do that. I also did not even register to the Pro version so this was with the Free version. Unintalled IOBit invasive software & hunted & removed all traces of this very invasive controlling software. I do not recommend installing it as it cannot be installed as a truly portable version & there are too few user controls or customizations. There are better & less invasive uninstallers out there & which I use. VERY INVASIVE in how it runs & what it also installs!!!!! Cannot really do a portable installation either, as it also installs AppData>IoBit folder with junk in it & when a "portable" installation is run. It also does not clean it out that folder when installing the "portable" installation. "Portable" installation also appears in the list of "Installed" programs, which a portable installation should not. Also NOT ENOUGH USER CONTROL & CUSTOMIZATION!!!! VERY INVASIVE CONTROL by IOBit. I tweaked the very few custom settings & tried to turn off any of the very few "Auto" settings & yet later up popped a notification that 2 programs needed updating!!! I didn't ask the program to do that. I also did not even register to the Pro version so this was with the Free version. Unintalled IOBit invasive software & hunted & removed all traces of this very invasive controlling software. I do not recommend installing it as it cannot be installed as a truly portable version & there are too few user controls or customizations. There are better & less invasive uninstallers out there & which I use. [ JonE ], yes, we have to turn off IObit auto-run, schedule, and resident invasions after running ANY IObit product -- the product is fine, the background nags are unnecessary and prevent me from recommending IObit to novices.
. [ JonE ], yes, we have to turn off IObit auto-run, schedule, and resident invasions after running ANY IObit product -- the product is fine, the background nags are unnecessary and prevent me from recommending IObit to novices. .
JonE, I agree totally, good software but they behave too aggressively to the end user. [ Michael Sanders ], on the one hand, I agree, giveaways should be uncompromised in a lot of ways, not only lasting forever, but reinstallable, if you want more, buy the next version. On the other hand, IObit programs work fine in their free versions, their pro versions adding the convenience of some automation and depth, but not necessary.
. [ Michael Sanders ], on the one hand, I agree, giveaways should be uncompromised in a lot of ways, not only lasting forever, but reinstallable, if you want more, buy the next version. On the other hand, IObit programs work fine in their free versions, their pro versions adding the convenience of some automation and depth, but not necessary. . I have download this and when it gets to 11% I get this: C:\users\cat54\appdata\local\temp\temp3_iobitUnistallerPro84-qf62.zip\Setup.exe. Make sure you typed the name correctly and try again. I am clicking on your file so don't know why it is doing this, I uninstalled the free one I had and it didn't work that way either.......HELP! I have download this and when it gets to 11% I get this: C:\users\cat54\appdata\local\temp\temp3_iobitUnistallerPro84-qf62.zip\Setup.exe. Make sure you typed the name correctly and try again. I am clicking on your file so don't know why it is doing this, I uninstalled the free one I had and it didn't work that way either.......HELP! Check ( chkdsk /f or chkdsk /r, and sfc /scannow ) and clean your computer ( any other tools, such as IObit advanced System Care ) and reboot. reboot in between fixes, make restore points. Download a fresh copy from IObit directly and try again. Reinstall your prior version, see if the serial number works, update from within the program. Let us know what you do that works.
. [ CAT ], Check ( chkdsk /f or chkdsk /r, and sfc /scannow ) and clean your computer ( any other tools, such as IObit advanced System Care ) and reboot. reboot in between fixes, make restore points. Download a fresh copy from IObit directly and try again. Reinstall your prior version, see if the serial number works, update from within the program. Let us know what you do that works. . I'm looking for an uninstaller/reinstaller that will copy the installation and allow me to reinstall the installation on same computer but with a clean OS image. Will this allow me to do that? Thank you. Not being able to control where you install like a thumb drive is a deal breaker. Hi, when it starts installing there is an option called 'Custom Install', so keep your eyes on that. In it you'll have a choice where to install (best to create own Folder beforehand on any Drive to make sure Files don't scatter all over the place, not saying iObit doesn't create a Folder, but being safe won't hurt..), another pre-checked box in Custom Install is to allow desktop icon. Good Luck! NOT [ Activate Now ].
. [ fran ], Click [ Enter Code ] NOT [ Activate Now ]. .
Hi Peter, thanks for trying to help me in this post-offer period. I don't think You understand my problem: every time I open this newly installed Program (Free, Pro, times and times again!!) I can see main body of it - where normally you would click 'Enter Code', and no, I get it - NOT [ Activate Now ], EXCEPT - all I get is Splash on TOP of BLURRED main black window of it (as in ACROSS everything!) telling me in red, crisp print: 'Unofficial IObit Uninstaller will not work any longer', and then it goes on - It will not only do harm to your PC performance but also leak your privacy..bla bla, 'Get the official IObit Uninstaller now to take your privacy and PC under powerful protection'..My only CHOICES on that Splash are:'Get Free' and Get PRO'. TRIED both countless times now no absolutely NO avail!! IObit Uninstaller in this state CANNOT be closed in any normal way, but using Task Manager. I have never EVER come across anything like it regarding IObit!!! I have checked with my PC protecting Software that these Installers are allowed, and free of any viruses/malware, that nothing 'IObit' is quarantined a.s.o. ?????? Another words: That's my Problem, not where to insert Reg Code! Do You follow? I have no idea any longer. I am sure IObit is fully aware of this, but will offer no help on their pages! Shame, booo:(( My PC has clean bill of health btw. Uninstalling this Software (because I will not put up with such nonsense!) offers no 'repair it' option either. I think I'm done here. If GOTD and IObit itself are NOT GOOD enough to class this Download/Installation as Official Sites, I don't know WHAT is!! Peter Blaise, Hi Peter, thanks for trying to help me in this post-offer period. I don't think You understand my problem: every time I open this newly installed Program (Free, Pro, times and times again!!) I can see main body of it - where normally you would click 'Enter Code', and no, I get it - NOT [ Activate Now ], EXCEPT - all I get is Splash on TOP of BLURRED main black window of it (as in ACROSS everything!) telling me in red, crisp print: 'Unofficial IObit Uninstaller will not work any longer', and then it goes on - It will not only do harm to your PC performance but also leak your privacy..bla bla, 'Get the official IObit Uninstaller now to take your privacy and PC under powerful protection'..My only CHOICES on that Splash are:'Get Free' and Get PRO'. TRIED both countless times now no absolutely NO avail!! IObit Uninstaller in this state CANNOT be closed in any normal way, but using Task Manager. I have never EVER come across anything like it regarding IObit!!! I have checked with my PC protecting Software that these Installers are allowed, and free of any viruses/malware, that nothing 'IObit' is quarantined a.s.o. ?????? Another words: That's my Problem, not where to insert Reg Code! Do You follow? I have no idea any longer. I am sure IObit is fully aware of this, but will offer no help on their pages! Shame, booo:(( My PC has clean bill of health btw. Uninstalling this Software (because I will not put up with such nonsense!) offers no 'repair it' option either. I think I'm done here. If GOTD and IObit itself are NOT GOOD enough to class this Download/Installation as Official Sites, I don't know WHAT is!! I agree -- software should check itself and repair itself. I think some other infection is gaslighting you, not IObit. Run FREE Malwarebytes AdwCleaner, clean, reboot, then run FREE Malwarebytes, clean, reboot. Scan whatever installer you have for IObit Uninstaller at VirusTotal and compare with the program directly from IObit scanned at VirusTotal. Yes, IObit programs are NOT clean at VirusTotal ! But, as other note in the thread, they contain UNWANTED nags which require us to manually turn off background additions to auto run, schedule, drivers after running EACH IObit program session. -- FREE Malwarebytes, clean, reboot. Others here also have their own list of favorite check and reset routines. I reinstall Windows 7 Pro often -- it's faster than troubleshooting and suffering for days!
. [ fran ], I agree -- software should check itself and repair itself. I think some other infection is gaslighting you, not IObit. 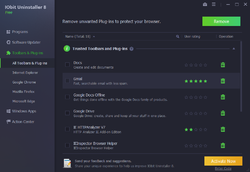 Run FREE Malwarebytes AdwCleaner, clean, reboot, then run FREE Malwarebytes, clean, reboot. Scan whatever installer you have for IObit Uninstaller at VirusTotal and compare with the program directly from IObit scanned at VirusTotal. SHA256:	869677da7b8f4f3b1603e5ef3184ef3428ae484686f88234f1b2261ae61fdb3b File name:	IObit-Uninstaller-v8.4.0.8-2019-03-19.exe Detection ratio:	4 / 69 Analysis date:	2019-03-22 06:34:18 UTC ( 3 hours, 52 minutes ago ) Antivirus	Result	Update Antiy-AVL	Trojan/Win32.Pynamer	20190322 DrWeb	Program.Unwanted.2520	20190322 K7AntiVirus	Unwanted-Program ( 005447211 )	20190322 K7GW	Unwanted-Program ( 005447211 )	20190322SHA256:	Yes, IObit programs are NOT clean at VirusTotal ! But, as other note in the thread, they contain UNWANTED nags which require us to manually turn off background additions to auto run, schedule, drivers after running EACH IObit program session. __________ Folks, ALWAYS thoroughly check your computer: -- FREE ChkDsk C: /f or ChkDsk C: /r and reboot, and wait -- FREE SFC /scannow, and wait -- FREE reboot into Safe Mode to effectuate further checks -- FREE Tweaking Repair Windows Repair, reset aliases, reset Windows defaults -- FREE make copious restore points so you can revert back -- FREE always check downloads at VirutTotal FIRST -- FREE Malwarebytes AdwCleaner to reset all Windows I/O defaults, clean, reboot, -- FREE Malwarebytes, clean, reboot. Others here also have their own list of favorite check and reset routines. I reinstall Windows 7 Pro often -- it's faster than troubleshooting and suffering for days! . Hi again and thank You for time and trouble You took to give me further instructions when You wrote 'I think some other infection is gaslighting you, not IObit'. I think I already said I checked this particular Download (the whole set of them!) like I do with EVERY piece before proceeding with Installation and it was CLEAN, unless SecureAPlus is telling porkies! Since IObit is the ONLY one coming up with this particular nonsense - I cannot spend more time than I already have running it through countless other Programs, free or paid - to determine if my PC is 'infected', or not! If that was the case I would already noticed something is seriously wrong. It would manifest itself, and trust me, I would know. Meantime, out of sheer curiosity - I did google this matter up to see if that IObit splash screen is known to anyone else, and guess what: it is! The exact one. Someone even posted a 'fix', a patch, but I will not use it. I used legitimate Installation, but if that needs a patch to fix it(??) it's NOT my way of d/loading Software from GOTD, or IObit! Peter Blaise, Hi again and thank You for time and trouble You took to give me further instructions when You wrote 'I think some other infection is gaslighting you, not IObit'. I think I already said I checked this particular Download (the whole set of them!) like I do with EVERY piece before proceeding with Installation and it was CLEAN, unless SecureAPlus is telling porkies! Since IObit is the ONLY one coming up with this particular nonsense - I cannot spend more time than I already have running it through countless other Programs, free or paid - to determine if my PC is 'infected', or not! If that was the case I would already noticed something is seriously wrong. It would manifest itself, and trust me, I would know. Meantime, out of sheer curiosity - I did google this matter up to see if that IObit splash screen is known to anyone else, and guess what: it is! The exact one. Someone even posted a 'fix', a patch, but I will not use it. I used legitimate Installation, but if that needs a patch to fix it(??) it's NOT my way of d/loading Software from GOTD, or IObit! Regardless, you are NOT getting an IObit message, you are getting an invasion or something is breaking. Confirm by trying the exact same IObit Uninstaller download form IObit directly BUT do it on someone else's computer, check it at VirusTotal, and then install it. SecureAPlus runs it's own interference and may be part of the problem, crippling IObit installations because ... PUP POTENTIALLY Unwanted Programs. Try a computer WITHOUT SecureAPlus, and with a fresh download of IObit Uninstaller. The goal is NOT to get IObit Uninstaller installed. The goal is to master your own computer to see what has invaded it and taken over control from you, leaving you compromised and unable to do what you want to do. IObit Uninstaller is just a test vehicle to help you figure out what's invaded your computer or what setting SecureAPlus has in it's defaults that are strangling your ability to use your computer fully. Upload a screenshot somewhere and link to it so we can figure out what's really going on when you see the 'Unofficial IObit Uninstaller will not work any longer' message.
. [ fran ], Can you re-find your Google search result where someone else discusses: -- 'Unofficial IObit Uninstaller will not work any longer' ? __________ Regardless, you are NOT getting an IObit message, you are getting an invasion or something is breaking. Confirm by trying the exact same IObit Uninstaller download form IObit directly BUT do it on someone else's computer, check it at VirusTotal, and then install it. SecureAPlus runs it's own interference and may be part of the problem, crippling IObit installations because ... PUP POTENTIALLY Unwanted Programs. 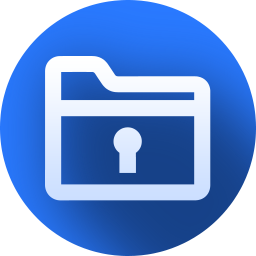 Try a computer WITHOUT SecureAPlus, and with a fresh download of IObit Uninstaller. The goal is NOT to get IObit Uninstaller installed. The goal is to master your own computer to see what has invaded it and taken over control from you, leaving you compromised and unable to do what you want to do. IObit Uninstaller is just a test vehicle to help you figure out what's invaded your computer or what setting SecureAPlus has in it's defaults that are strangling your ability to use your computer fully. __________ Again, please re-find and share a link reference to your Google search result where someone else discusses: -- 'Unofficial IObit Uninstaller will not work any longer' I could find nothing. Upload a screenshot somewhere and link to it so we can figure out what's really going on when you see the 'Unofficial IObit Uninstaller will not work any longer' message. Thanks, and good luck. .
Hi Peter, thanks again, goodness, didn't expect further comments from You, are You working for IObit help team? See Your name popping here from time to time, but never really paid attention when You most appear to offer help, sorry. I'm sure if You google up title You posted above You'll find it! (use Google Images for searching, art of googling, lol) I really don't care that much about testing my laptop using this IObit Installation as some 'dipstick' trying to install it on different PC a.s.o. Naah, not worth it. To be honest I don't even know why I tried this Offer couple of day's ago, I too find IObit Software too intrusive, or too 'harsh' when using it's Uninstaller (have different trusted ones I use regularly), but seem to remember from long ago it had one useful (for me anyway) option of removing unwanted Internet extensions, toolbars and 'bits' of that nature. There, I just answered my own question why:) Thanks anyway, btw my old beta-testing days are well over (did a few in past decade), but I try to share concerns like anybody on GOTD when using it, ask questions when I'm stuck, visit Forum, or post a solution if I can and have time. And finally I repeat NONE other than IObit Installation tells me their Software is unofficial..Not even some expensive one (in case I obtained it 'illegally', which I have no habit of), but Free stuff when d/loaded from IObit own Site?? Bonkers!! I bid You good day. Peter Blaise, Hi Peter, thanks again, goodness, didn't expect further comments from You, are You working for IObit help team? See Your name popping here from time to time, but never really paid attention when You most appear to offer help, sorry. I'm sure if You google up title You posted above You'll find it! (use Google Images for searching, art of googling, lol) I really don't care that much about testing my laptop using this IObit Installation as some 'dipstick' trying to install it on different PC a.s.o. Naah, not worth it. To be honest I don't even know why I tried this Offer couple of day's ago, I too find IObit Software too intrusive, or too 'harsh' when using it's Uninstaller (have different trusted ones I use regularly), but seem to remember from long ago it had one useful (for me anyway) option of removing unwanted Internet extensions, toolbars and 'bits' of that nature. There, I just answered my own question why:) Thanks anyway, btw my old beta-testing days are well over (did a few in past decade), but I try to share concerns like anybody on GOTD when using it, ask questions when I'm stuck, visit Forum, or post a solution if I can and have time. And finally I repeat NONE other than IObit Installation tells me their Software is unofficial..Not even some expensive one (in case I obtained it 'illegally', which I have no habit of), but Free stuff when d/loaded from IObit own Site?? Bonkers!! I bid You good day. Well, that was a lot of work to say "no thanks". I finally found an image of your 'Unofficial IObit Uninstaller will not work any longer' on a crack patch website, so that's a dead end. And that, folks is called "troubleshooting". I understand why you got the 'Unofficial IObit Uninstaller will not work any longer' message, and I understand what it would take to resolve the issue. Though you don't value IObit Uninstaller, you still have an unresolved infection. If you can cause that message to appear on screen again, you can us free Microsoft SysInternals ProcExp to identify the directory location and file responsible, and you can go from there to eliminate at least one of your infections.
. [ fran ], Well, that was a lot of work to say "no thanks". I finally found an image of your 'Unofficial IObit Uninstaller will not work any longer' on a crack patch website, so that's a dead end. How did you get a crack patch then? =8^o And that, folks is called "troubleshooting". I understand why you got the 'Unofficial IObit Uninstaller will not work any longer' message, and I understand what it would take to resolve the issue. Though you don't value IObit Uninstaller, you still have an unresolved infection. If you can cause that message to appear on screen again, you can us free Microsoft SysInternals ProcExp to identify the directory location and file responsible, and you can go from there to eliminate at least one of your infections. Good luck. .
Hi, since I've been notified by e-mail there was yet another entry from You under our 'debate', after reading what You have added to it - I'm here to merely defend myself, please note. Look Peter! It was YOU eagerly asking me to disclose my Google find, since You couldn't find it Yourself, which I didn't have to. I regret now I did, especially seeing Your 'you naughty girl, what crack-patch Websites are you visiting while troubleshooting!??'.. I was just trying to be truthful to the fact I mentioned in one of my earlier posts that I did manage to FIND exact IObit nag-screen, so it's not 'just me', as people often wonder when they are baffled? If anything - it only proves IObit issues such Screens, only I never tried to obtain ANYTHING from IObit that would amount to illegal usage of their Software!! Moreover, I did not STUDY that Site You consider 'no go area for starters', neither I saw any WARNING not to go there, or even at one's own risk. Just the Site regular Google link took me to - with some entries and images on that page offering a 'patch' for a screen that looked identical to mine. I don't know these people/Site from Adam to know what they're up to for that matter. If 'patch' is the same terminology for 'crack', I was not aware of their lingo! Besides, why would people seek 'cracks' to fix FREE Program?? So my understanding was there must be some 'glitch' in that Installation and that patch is for it. I didn't go for using it, as I mentioned, I could see no point. If You do, and know how to apply it - then go ahead and see for Yourself what's that about and if it works? I'm sure IObit would welcome such investigation! All known Softwares as we know offer own Patches from time to time as regular updating/upgrading solutions and we all used them I'm sure (Corel, Photoshop a.s.o) because that's normal and legal! As to troubleshooting particular Software - anyone can see for themselves while researching using Google - positions with 'cracks' for this and that, but I'm not some novice not to realize what's that about, or indeed how dodgy it can be, so please don't try to educate me Sir with Your 'no wonder your computer is in a mess and infected', OR to that effect anyway!?? That's not helpful, that's a tad sarcastic and patronizing? Lastly - How many times here on GOTD I see someone not being able to Install something while I just did easily! Do I go telling them 'there must be something wrong with your PC, because I had NO PROBLEM with it whatsoever?? Or - your machine must be infected? Is that even polite? If initially I was grateful You stepped in seeing my post to a User called Juan - now after these back and forth exchanges - this whole situation reminds me of.. meeting a stranger in the street you're trying to help, and another passer-by joins in, happens to be some doctor, and next tells you you're about to die, best if you went promptly to his clinic to do a number of tests..LOL! Please. Hope You can see that if I was desperate to seek advice on 'infected' computer I would use more appropriate occasion for it than IObit Uninstaller Giveaway Day! If You regard this post as my another OVER-lengthy way of saying 'no, thanks', than look above what (on earth) You came up with!.. haha:) Thanks for Your help never the less and kind Regards. Peter Blaise, Hi, since I've been notified by e-mail there was yet another entry from You under our 'debate', after reading what You have added to it - I'm here to merely defend myself, please note. Look Peter! It was YOU eagerly asking me to disclose my Google find, since You couldn't find it Yourself, which I didn't have to. I regret now I did, especially seeing Your 'you naughty girl, what crack-patch Websites are you visiting while troubleshooting!??'.. I was just trying to be truthful to the fact I mentioned in one of my earlier posts that I did manage to FIND exact IObit nag-screen, so it's not 'just me', as people often wonder when they are baffled? If anything - it only proves IObit issues such Screens, only I never tried to obtain ANYTHING from IObit that would amount to illegal usage of their Software!! Moreover, I did not STUDY that Site You consider 'no go area for starters', neither I saw any WARNING not to go there, or even at one's own risk. Just the Site regular Google link took me to - with some entries and images on that page offering a 'patch' for a screen that looked identical to mine. I don't know these people/Site from Adam to know what they're up to for that matter. If 'patch' is the same terminology for 'crack', I was not aware of their lingo! Besides, why would people seek 'cracks' to fix FREE Program?? So my understanding was there must be some 'glitch' in that Installation and that patch is for it. I didn't go for using it, as I mentioned, I could see no point. If You do, and know how to apply it - then go ahead and see for Yourself what's that about and if it works? I'm sure IObit would welcome such investigation! All known Softwares as we know offer own Patches from time to time as regular updating/upgrading solutions and we all used them I'm sure (Corel, Photoshop a.s.o) because that's normal and legal! As to troubleshooting particular Software - anyone can see for themselves while researching using Google - positions with 'cracks' for this and that, but I'm not some novice not to realize what's that about, or indeed how dodgy it can be, so please don't try to educate me Sir with Your 'no wonder your computer is in a mess and infected', OR to that effect anyway!?? That's not helpful, that's a tad sarcastic and patronizing? Lastly - How many times here on GOTD I see someone not being able to Install something while I just did easily! Do I go telling them 'there must be something wrong with your PC, because I had NO PROBLEM with it whatsoever?? Or - your machine must be infected? Is that even polite? If initially I was grateful You stepped in seeing my post to a User called Juan - now after these back and forth exchanges - this whole situation reminds me of.. meeting a stranger in the street you're trying to help, and another passer-by joins in, happens to be some doctor, and next tells you you're about to die, best if you went promptly to his clinic to do a number of tests..LOL! Please. Hope You can see that if I was desperate to seek advice on 'infected' computer I would use more appropriate occasion for it than IObit Uninstaller Giveaway Day! If You regard this post as my another OVER-lengthy way of saying 'no, thanks', than look above what (on earth) You came up with!.. haha:) Thanks for Your help never the less and kind Regards. I appreciate that you have no energy to find out any more about whatever when wrong with your attempted IObit Uninstaller installation, and thanks for the sort-of lead to what you saw, which was new to me, and educational. Sorry I have nothing useful for you regarding help or a fix or info, but hey, it happens. It's not really possible to use IObit software "illegally" since it's given away freely, and even pro licenses are anonymous, and either work, or don't. "Patch cracks" are offered by folks for two reasons, ( 1 ) to turn on the pro features, and ( 2 ) to infect gullible folks ... and there are "patch cracks" offered for any program whether they need it or not because of ( 2 ). Functional "patch cracks" cause a program to skip checking for a license, or convince it that it has a license, or some equivalent, such as copying a DLL from a licensed version for use elsewhere, like on a rebuild machine after a crash -- not all "patch cracks" are bad or intended to skirt appropriate software use. I often salvage PCs from the trash room in my apartment complex and learn a lot by wasting way more time on them than they will ever be worth, but it's one way I learn, and I often find that folks just gave up troubleshooting what turns out to be a rather simple problem. And I do wish I understood enough about your IObit Uninstaller misbehavior to be able to duplicate the problem, for any number of reasons, including ( a ) keeping GOTD a go-to place for a helpful community, ( b ) mastering IObit's quirks, and ( c ) knowing more about ( 2 ) above. But just because I want something does not mean it's available. No, I was not indicting your integrity, I was speculating, and have seen many folks get infected unawares, but all we can do is speculate what went wrong for you, and speculation doesn't get anybody anywhere. Thanks for kicking it around.
. [ fran ], I appreciate that you have no energy to find out any more about whatever when wrong with your attempted IObit Uninstaller installation, and thanks for the sort-of lead to what you saw, which was new to me, and educational. Sorry I have nothing useful for you regarding help or a fix or info, but hey, it happens. __________ It's not really possible to use IObit software "illegally" since it's given away freely, and even pro licenses are anonymous, and either work, or don't. __________ "Patch cracks" are offered by folks for two reasons, ( 1 ) to turn on the pro features, and ( 2 ) to infect gullible folks ... and there are "patch cracks" offered for any program whether they need it or not because of ( 2 ). Functional "patch cracks" cause a program to skip checking for a license, or convince it that it has a license, or some equivalent, such as copying a DLL from a licensed version for use elsewhere, like on a rebuild machine after a crash -- not all "patch cracks" are bad or intended to skirt appropriate software use. __________ I often salvage PCs from the trash room in my apartment complex and learn a lot by wasting way more time on them than they will ever be worth, but it's one way I learn, and I often find that folks just gave up troubleshooting what turns out to be a rather simple problem. And I do wish I understood enough about your IObit Uninstaller misbehavior to be able to duplicate the problem, for any number of reasons, including ( a ) keeping GOTD a go-to place for a helpful community, ( b ) mastering IObit's quirks, and ( c ) knowing more about ( 2 ) above. But just because I want something does not mean it's available. No, I was not indicting your integrity, I was speculating, and have seen many folks get infected unawares, but all we can do is speculate what went wrong for you, and speculation doesn't get anybody anywhere. Thanks for kicking it around. .
Hello there - does anybody know how this may compare to Revo uninstaller pro? Any advantages/disadvantages? The FREE version of IObit Uninstaller can batch uninstall, the FREE version of Revo only uninstalls one program at a time. FREE Revo has more cleaners. IObit expects you to use FREE IObit Advanced System Care or FREE IObit Smart Defrag to clean, because FREE / PRO IObit Uninstaller only searches for orphans, not cache and temp files unrelated to installations. FREE IObit Uninstaller offers a list of your programs that need update and the PRO will update them all at once, FREE Revo has no updater. I use them both for each program's strengths.
. [ Emil Kucera ], The FREE version of IObit Uninstaller can batch uninstall, the FREE version of Revo only uninstalls one program at a time. FREE Revo has more cleaners. IObit expects you to use FREE IObit Advanced System Care or FREE IObit Smart Defrag to clean, because FREE / PRO IObit Uninstaller only searches for orphans, not cache and temp files unrelated to installations. 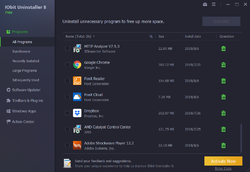 FREE IObit Uninstaller offers a list of your programs that need update and the PRO will update them all at once, FREE Revo has no updater. I use them both for each program's strengths. . Thanks Peter, appreciate all your comments here, not just the answers to my own! Stuck at "installing 11% ". I can close the installation window but downloading again and trying to reinstall again takes me immediately back to the 11% installing. Any advice? Thanks. great program, tested, and I bought the program license. iobit has great software. giveawayoftheday is a the best software review, testing center on the internet, a great forum for comparing and evaluation. iObit thanks!! 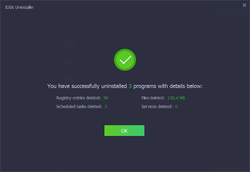 IObit Uninstaller, very good! I use IOBit Uninstaller Free Version on my Windows 10 Home 64 bit computer .. it does the job just fine. No need for the so called "extras" in the Pro version and certainly not with a 6 month license. The pro version facilitates updates to various software it finds, very convenient.
. [ Bruce ], The pro version facilitates updates to various software it finds, very convenient. .
Bruce, My expired version (ie. fell back to free Version) was not able to uninstall the Adobe Desktop Suite but this did the job nicely! Yes, I know that. For me it is an unnecessary feature. Most programs, like Winrar, Flash, Java, etc have built in update check as an option already. For those that don't I check for myself every few months. In most cases, it is as simple as: If it still does what I need it to do, why update it. Peter Blaise, can you provide more detail about the benefits of the pro version? Install ANY IObit software, and it will clearly show [ Pro ] next to any feature that requires a license, all other features being free forever. So, install and see if you care about the [ Pro ] features, not just of IObit Uninstall, but ALL Iobit programs ( except IObit Malware Fighter which has no function except with a license ).
. [ Lori ], Install ANY IObit software, and it will clearly show [ Pro ] next to any feature that requires a license, all other features being free forever. So, install and see if you care about the [ Pro ] features, not just of IObit Uninstall, but ALL Iobit programs ( except IObit Malware Fighter which has no function except with a license ). . . Agreed, I often use "auto update" lists as a reminder for me to go and manually update each program from within each program itself, especially Firefox and Opera and any program that has it's own update check. The endless "update the following list" is often just a reminder for me to go and do it manually. However, IObit Uninstaller PRO does download and save the installer, and that's a nice resource for the future, and it can automate updating the entire list, and that's nice.
. [ Bruce ], Agreed, I often use "auto update" lists as a reminder for me to go and manually update each program from within each program itself, especially Firefox and Opera and any program that has it's own update check. The endless "update the following list" is often just a reminder for me to go and do it manually. 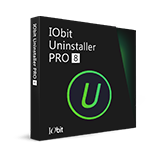 However, IObit Uninstaller PRO does download and save the installer, and that's a nice resource for the future, and it can automate updating the entire list, and that's nice. .
IOBit Uninstaller is a very good software, I have used it for years. But 6 months is a very limited license. I will pass this one, I use the one I already have. It does a very good job and is very easy to use. All the pro version does is offer to facilitate updating software it finds with direct download and install, instead of sending you to a web page to update software yourself. Otherwise, this is smarter and faster than prior versions, and the free version is forever free. Don't Worry Every 2 Month There Will Be Uninstaller Giveaway. Kjell, Don't Worry Every 2 Month There Will Be Uninstaller Giveaway. Can this program remove orphaned registry entries that are in the registry before it is installed? Now that's a challenge -- "can this program do something before it is installed?" Orphaned registry entries are better addressed by ANY registry cleaner ( which 50 % of users here say DON'T USE, they are DANGEROUS !). I use registry cleaners daily, hence my savvy on which ones are safe and which are dangerous. Glary and CCleaner in NON-DEEP mode are safe. When uninstalling something with IObit Uninstaller, it will search the registry to remove RELATED entries that were left behind. But it doesn't do an general "orphan" search in the registry.
. [ Gary ], Now that's a challenge -- "can this program do something before it is installed?" No. Orphaned registry entries are better addressed by ANY registry cleaner ( which 50 % of users here say DON'T USE, they are DANGEROUS !). I use registry cleaners daily, hence my savvy on which ones are safe and which are dangerous. Glary and CCleaner in NON-DEEP mode are safe. __________ When uninstalling something with IObit Uninstaller, it will search the registry to remove RELATED entries that were left behind. But it doesn't do an general "orphan" search in the registry. .
Peter Blaise, __ I stopped using CCleaner a long time ago, after losing confidence in it after some scandal or other, and now only use JV16 Power Tools. eejaym, absolutely right. Between CCleaner and Bleach Bit, enough necessary registry entries were removed that my Windows no longer functioned. Clean reinstall would not work in System Recovery either. A pro had to do the reinstall for more than 100 USD. Worked just fine ever since. CCleaner was distributed with a virus when Avast first bought them, then Avast had it phone home even if you turned that off. Both problems killed sales, so Avast cleaned up the program and it is okay again, no virus, no phone home after you turn off the phone home feature.
. [ eejaym ], CCleaner was distributed with a virus when Avast first bought them, then Avast had it phone home even if you turned that off. 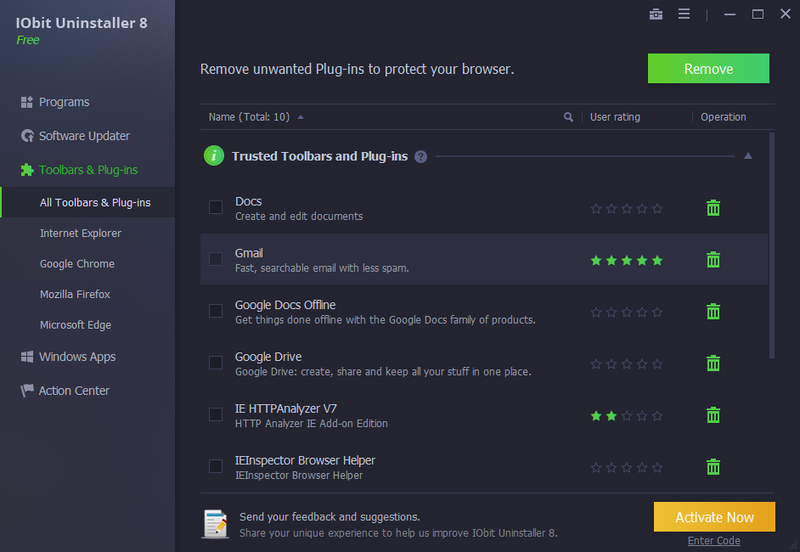 Both problems killed sales, so Avast cleaned up the program and it is okay again, no virus, no phone home after you turn off the phone home feature. . I've used iOBit products for more years than I can remember but I got to old to afford them so I'll take the 6 months. Thanks to iOBit, giveawayoftheday.com and our members who not only test these programs but then take the time to tell us their opinions and results. SALUTE!!! The FREE version of IObit programs are as effective as most folks need, the PRO version only adding some features like automation and depth, but all revert to FREE and still great after the license expires, and new version can be installed FREE anytime without a license. The only exception is IObit Malware Fighter which I find useless in either the free or pro version.
. [ John M ], The FREE version of IObit programs are as effective as most folks need, the PRO version only adding some features like automation and depth, but all revert to FREE and still great after the license expires, and new version can be installed FREE anytime without a license. The only exception is IObit Malware Fighter which I find useless in either the free or pro version. .
i just install it. one of my favorite programs (NOT the SystemCare). i just install it. one of my favorite programs (NOT the SystemCare). great... thanks. Rutenis Kukanauza, The key is in the readme.txt file. Gary and Kuka ... Yes, indeed. That's why it's named R E A D M E.txt rather than "Don'tbothertoReadMe.txt". If I monitor an installation today, will uninstall work after the six months is up? YEs, all IObit PRO versions work forever, referting to the FREE verion when the license expires, loosing some automation and depth. So, yes, it will be aware of any monitored installation when you go to uninstall. You can also update IObit versions anytime, and they will be aware of prior version settings and resources, though the license may not convey and they will be the free version. The FREE version of IObit programs are still excellent and functional.
. [ YD Forums ], YEs, all IObit PRO versions work forever, referting to the FREE verion when the license expires, loosing some automation and depth. So, yes, it will be aware of any monitored installation when you go to uninstall. You can also update IObit versions anytime, and they will be aware of prior version settings and resources, though the license may not convey and they will be the free version. The FREE version of IObit programs are still excellent and functional. ( Except IObit Malware Fighter which I find useless in either the free or pro version. ) . No, after the 6 months expires it will become a free version.. No need to uninstall unless you no longer want it.. The free version is just as good as the paid version. YD Forums, No, after the 6 months expires it will become a free version.. No need to uninstall unless you no longer want it.. The free version is just as good as the paid version. It Will Monitor Every Action During Installation.... Detect Hidden Folders, Registries, Installed Drivers In Windows System Files Etc. Keeps A Log File Of Whole Process Installation. YD Forums, No Worries It Will Monitor Every Action During Installation.... Detect Hidden Folders, Registries, Installed Drivers In Windows System Files Etc. Keeps A Log File Of Whole Process Installation. Peter Blaise, absolutely true regarding input malware fighter. I have been using advanced system care / iObit programs for years, and I agree. dadams, About every six months we get a new version here. As long as they do that, I have no problems with the six months limit. dadams, Free version is almost identical and you can have updates for as long as they are making the program. Download and install this and SEE FOR YOURSELF what the PRO version covers compared to the FREE version. Pro: Facilitated updates to other programs. Free: manual updates to other programs. The free version is not crippled, it does everything an uninstaller should do, better than most others uninstallers, and is always free, updatable anytime forever, and forever free. 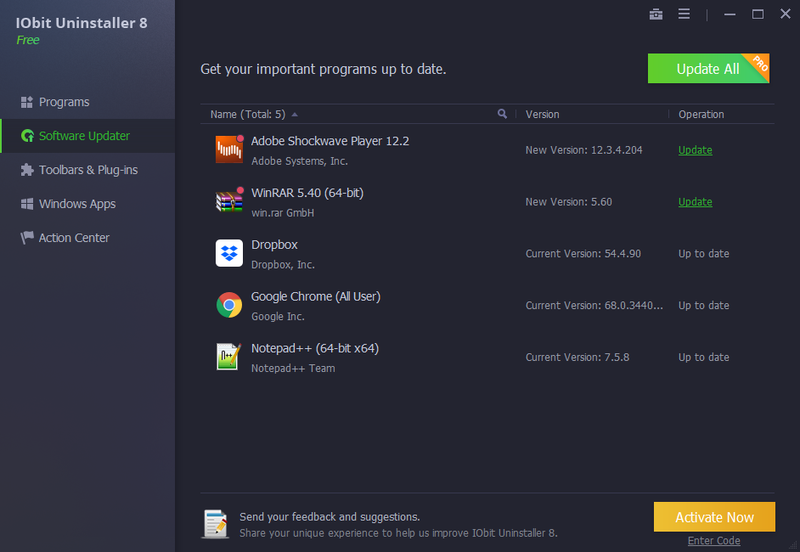 You can also update ANY IObit program versions anytime, and they will be aware of prior version settings and resources, though the license may not convey and they will then be the free version.
. [ dadams ], Download and install this and SEE FOR YOURSELF what the PRO version covers compared to the FREE version. Pro: Facilitated updates to other programs. Free: manual updates to other programs. That's it. The free version is not crippled, it does everything an uninstaller should do, better than most others uninstallers, and is always free, updatable anytime forever, and forever free. You can also update ANY IObit program versions anytime, and they will be aware of prior version settings and resources, though the license may not convey and they will then be the free version. The FREE version of IObit programs are still excellent and functional. ( Except IObit Malware Fighter which I find useless in either the free or pro version. ) . If New Version Is Released There Will Be A Giveaway Key With in 15 Days. This Is How I Will Use Iobit Products. Correct, folks can go to the IObit web site and look up comparisons between their PRO versions and their FREE versions. The reason to ASK ask here it to get other user's experience regardless of programmer's claims. FREE: manual updates to other programs ( manual ). Thanks for the opportunity to review and make this thread as complete as possible -- one would think that IObit and GOTD themselves would put that comparison chart between PRO and FREE right here in the discussion thread page. Well, it gives us something to do then, doesn't it?
. [ Robert ], Correct, folks can go to the IObit web site and look up comparisons between their PRO versions and their FREE versions. The IObit comparison chart claims that the Pro version adds these features: -- Get rid of bundled programs and plug-ins WHILE uninstall main program -- SUPPORT removing stubborn programs -- SUPPORT removing malicious plug-ins -- AUTO clean leftovers that cannot be deleted by other utilities -- AUTO 1-click to update all important software -- Auto Update to the latest version Where the FREE version would require you to: -- MANUALLY individually get rid of bundled programs and plug-ins after uninstall main program -- MANUALLY select stubborn programs -- MANUALLY removing malicious plug-ins -- MANUALLY clean leftovers that cannot be deleted by other utilities -- MANUALLY update each found other software -- MANUALLY update to the latest version Pro = automated convenience. FREE = manual. The reason to ASK ask here it to get other user's experience regardless of programmer's claims. As I wrote from my experience: PRO: Facilitated updates to other programs ( automated convenience ) FREE: manual updates to other programs ( manual ). Thanks for the opportunity to review and make this thread as complete as possible -- one would think that IObit and GOTD themselves would put that comparison chart between PRO and FREE right here in the discussion thread page. Well, it gives us something to do then, doesn't it? .